Following on from the success of the Wild Atlantic Way in Ireland, Tourism Minister Paschal Donohoe has unveiled Fáilte Ireland’s latest tourism initiative: a campaign called “Ireland’s Ancient East” which aims to attract people taking a trip to Ireland to the south east. The new initiative’s goal is to attract 600,000 foreign visitors to the regularly by-passed South East Coast and South Coast of Ireland. The new scheme aims to mirror the success of the 2,500km Wild Atlantic Way route from Donegal to Cork. The Wild Atlantic Way route has been a huge success since it’s launch in 2014 with many local businesses, restaurants and hotels benefiting from the surge in visitors taking a vacation in Ireland. Fáilte Ireland spokesman Alex Connelly claims that the Wild Atlantic Way was a clever marketing initiative that “took stuff that was there already but was re-packaged”. 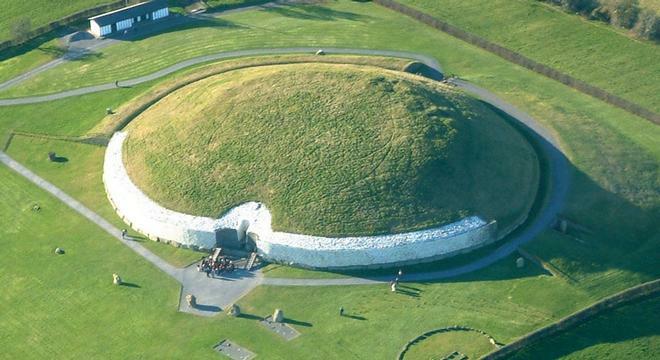 Newgrange- just one of the famous attractions set to be promoted heavily in the new “Ireland’s Ancient East” route. The new “Ancient East” initiative is also similarly a re-branding exercise, however Mr Connolly, spokesman for Fáilte Ireland has stressed that the initiative aims to provide an “umbrella destination” with the main goal of bringing hundreds of attractions under one marketing banner. This new campaign is set to launch in 2016 following consultation with local tourism providers. Similar to how the Wild Atlantic Way has numerous roads signposted, now hundreds of road signs in the South East of Ireland will be signposted with distinctive celtic-inspired logos. The majority of visitors to Ireland are found to fly into Ireland’s capital city of Dublin where they are found to visit the tourist attractions and top Dublin restaurants. However the goal of this new initiative is to encourage visitors to stay at least one night outside of Dublin, which Fáilte Ireland believes will generate approximately €950 million to the Irish economy. The new initiative is set to be divided into four sub-themes, one of which is “Ancient Ireland” which showcases famous sites such as Boyne Valley and the prehistoric passage tombs at Newgrange as well as “Early Christian Ireland” including Clonmacnoise and Glendalough. “Medieval Ireland” is also set to include Kilkenny city’s medieval mile while Anglo Ireland will feature architectural gems including Powerscourt estate in County Wicklow. This entry was posted in Activities in ireland, Best Attractions in Ireland, Best Places to visit in Ireland, dublin, Ireland, Ireland Travel, Ireland vacations, Ireland Vacations 2015, Ireland's Ancient East, Irish Festivals, Irish Genealogy, Travelling around Ireland, Uncategorized, vacation to Ireland, Visitor Attractions, Wild Atlantic Way and tagged Clonmacnoise, East Coast of Ireland, Glendalough, Ireland's Ancient East, Ireland's attractions, Newgrange, Trip to Ireland, Vacation in Ireland, Wild Atlantic Way. Bookmark the permalink.